YouTube – the name itself sounds success. This video sharing platform has been providing information (through videos) on varying subjects. There has been in the number of video uploads by the users. This process (of video uploading by users) is called YouTube Channel which is the home page showing the account name, the account type, the public videos uploaded by the user and any user information entered by the user. In view of the huge potential promised by YouTube channels, there is stiff competition to place the content (by many marketers) on this channel. Ultimately, the success of the marketer is decided when they are able to stand above the rest. For ensuring success of YouTube Channel, some or all of the following ways may be adopted by the marketers. 1) Business Cards, as usual, carry the basic information about the company including its contact details and also the products that it handles. Mention of your YouTube Cooking Channels on the business cards will be instantly popularizing the channel. 2) T-Shirt marketing promotes your YouTube Cooking Channel. You can distribute custom T-Shirts mentioning your channel details along with the URL. Free distribution of t-shirts (give away) will add to your promotion as those people wearing those t-shirts (with your channel details) will be expanding the potential reach. 3) Social media presence is required. 4) Email marketing is the unique promotion of your channel. A collection of the email address will enable you to deliver your newsletter (with necessary updates about your channel) to the targeted audience. 5) Ad words will promote your channel. TrueView Ads are paid advertisements and that are coming with a skip option (after 5 seconds) and are played before the actual video requested by the user. 6) Video SEO needs to be applied. As always applicable on content marketing, video search engine optimization is applicable for the promotion of your YouTube Cooking Channel as well. 7) Blogging brings huge promotion. Every time you create a blog post, it will be bringing new customers. Conversion of these visitors as viewers of your channel is required. 8) Use of appropriate forums (the place of discussion) is required for promotion of your channel. For the promotion of your channel, you need to take part in discussions (online) whenever they are taking place and are relevant to your channel. 9) Contests with cool prize attract newer viewers for your channel. Contests are sure to garner a lot of interest by viewers in your channel. 10) Vidcon being the largest gathering of video creators, you need to meet and network with other channels in cooking industry. 11) Meetup Group with YouTube video creators allows you to increase your circle and promote your channel as well. 12) Collaborate with other YouTube Video Creators allows you create a bigger audience. 13) Speaking at relevant events allow you to showcase your expertise. 14) Video commenting by you on videos of others videos allows the viewers know about your YouTube channel. 15) Blog commenting is another way to get your YouTube Chanel increased circulation/viewer base. 16) Sticker marketing highlighting your cooking channel URL and the great tagline is the simplest way to market your channel. 17) Advertising your channel URL on your car is another way to promote the channel. Wherever your car goes your channel gets a promotion. 18) Writing for relevant magazines (in the cooking field) allows you to showcase your industry knowledge thereby enriching viewer base for your YouTube Cooking Channel. 19) Publications in the press are similar to that of writing for relevant magazines (point NO.18). 20) Starting a Podcast allows you to provide more content to your content on your channel. 21) Email with signature (and channel URL) will automatically propagate your channel to all the recipients of your emails. 22) Guest blogging allows you to reap benefits (without managing a blog) as that of managing a blog. 23) Renting a booth at events or trade shows has its own impact in contributing to the promotion of your channel. 24) Hosting workshop, though involves some budgets, will promote your channel. 25) Google+ community can be started for creating a place for others to discuss. 26) YouTube fan finder program are an offer by YouTube. It will allow you to submit up to 5 ads for your channel. 27) Interact with your audience on a regular basis through scheduling/FAQ etc. 28) YouTube Thumbnails will attract viewers to your YouTube Cooking channel. 29) Use of proper hashtags is required for promotion of your channel on social media including Google+, Twitter, FaceBook etc. 30) Playlists will harness the viewers to your site till completion of all the videos in the playlist. 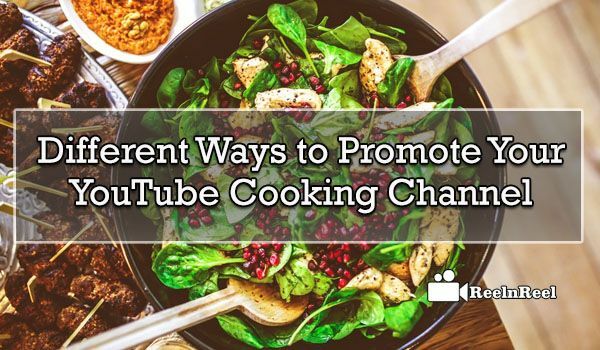 Like other channels on YouTube, your YouTube Cooking Chanel also needs proper promotion. Following some or all the above steps will ensure reasonable success for your channel on YouTube.